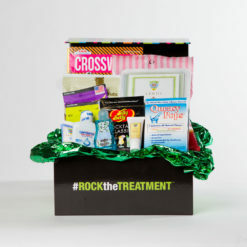 At ROCK the TREATMENT™, we offer a specially designed gift basket for radiation patients. Like our chemo baskets, our radiation basket is designed specifically for the unique challenges someone faces when undergoing radiation treatment. Receiving radiation therapy is difficult for anyone. Typically, you get treated five times a week, with a two-day rest to help your body heal. During this time, many patients feel tired and worn out, requiring extra rest sleep and downtime to recoup. In addition, the skin around the area of their treatment is also receiving radiation, and it can become highly sensitive. Of course, it can also be very difficult emotionally. Coping with a cancer diagnosis is hard for anyone, and you must fight the fear that can come along with it. That’s why having loved ones around to support and encourage are so important, and it’s why we hope that our gift baskets can be a small part of that. Our radiation gift baskets are packed with items handpicked to suit the needs of the cancer patient undergoing radiation treatment. After all, knowing what to buy someone as a get well gift upon hearing about a cancer diagnosis is tough. You want to be supportive and helpful, so you also don’t want to purchase something that wouldn’t be appropriate. 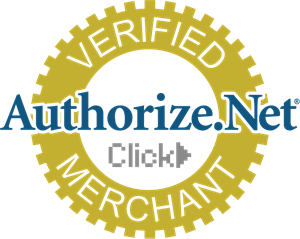 We take the guesswork out of that for you with our specially curated baskets. Our radiation therapy basket is filled with many special items to help your friend or loved one cope with the unique challenges of radiation therapy. 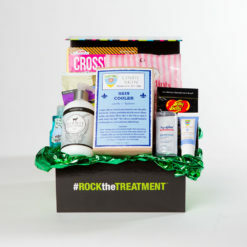 The radiation treatment gift basket includes puzzles to focus the mind, snacks to boost energy, and premium quality skincare products to help soothe and heal the skin damage often caused by radiation therapy. The goal is to help cancer patients stay engaged, keep up their energy, and stay comfortable and healthy. Ultimately, your encouragement and support bring hope, and our hope is that you can both show a kind gesture to your loved one and also help them remained focused on what matters most – getting better! That’s why, when developing our radiation therapy basket, we talked to cancer patients, survivors, medical professionals, and caregivers to better understand exactly which types of gifts would be most useful and encouraging to cancer patients. What we ended up with was something that many who have received it have called life-changing! If your friend or loved one is a cancer patient undergoing radiation treatment, this Radiation Therapy Gift is sure to help him or her ROCK the TREATMENT™!